← Not my giveaway but….enter to win a Kindle Fire or $100 Amazon gift card of paypal. Received these chips from bzzagent.com for free to try out and review! If you love chips but really don’t like the unhealthy part of them? 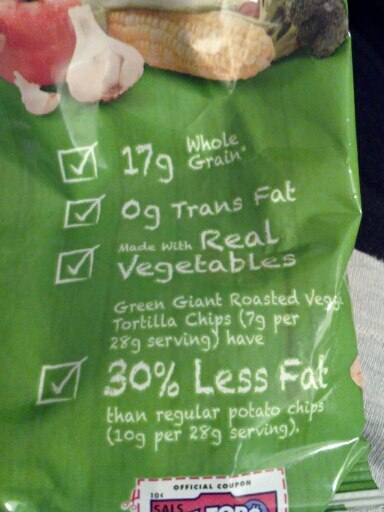 Try Green Giant Veggie Snack Chips. My favorite was Roasted Veggie Tortilla Chips with Zesty Cheddar. They’re healthy doritos! My 2 year old even loves them. We both just sat there and kept eating them. Great snack- Made me feel full and satisfied. Now, the Multigrain Sweet Potato Chips with Sea Salt… I didn’t like so much. They tasted… odd. I had to spit it out. My mom on the other hand, loves them so, I would still say give them a try too. It just all depends on your own taste in food. This entry was posted in Bzzagent reviews. Bookmark the permalink.